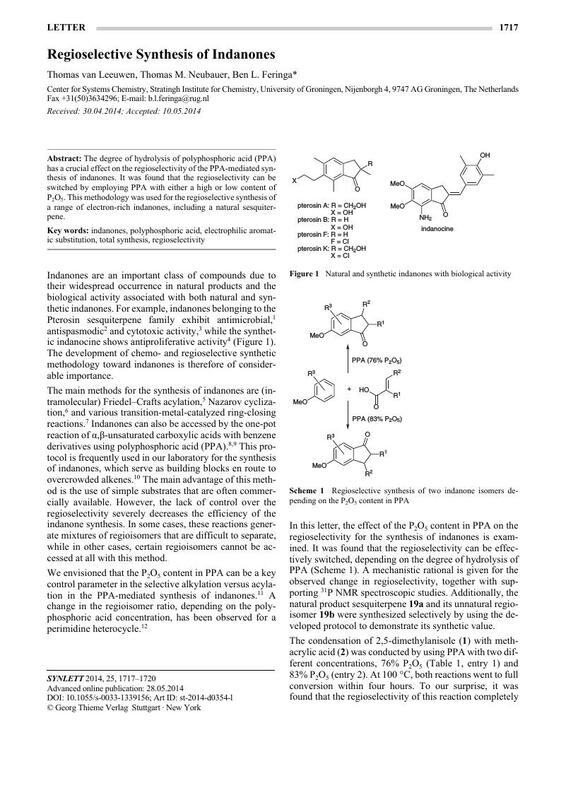 The degree of hydrolysis of polyphosphoric acid (PPA) has a crucial effect on the regioselectivity of the PPA-mediated synthesis of indanones. It was found that the regioselectivity can be switched by employing PPA with either a high or low content of P2O5. This methodology was used for the regioselective synthesis of a range of electron-rich indanones, including a natural sesquiterpene. for this article is available online at http://www.thieme-connect.com/products/ejournals/journal/ 10.1055/s-00000083. 11 The theoretical P2O5 content in PPA is also referred to as the PPA concentration or the degree of hydrolysis of PPA.